Paul Poteet has been a part of central Indiana Media since 1982. “Indiana’s Weatherman” is a meteorologist and morning drive radio character. Every weekday he’s heard on 6 radio stations, and his Webcam Weather is seen on 6 newspaper and entertainment web sites, including INDYSTAR dot com. He produces and co-hosts the “Paul & Tom” Internet Radio Show. He’s the co-host of the syndicated “Pet Pals TV” show with Patty Spitler. Poteet has done tv weather for WISH TV 8 and has been a feature contributor to WTHR Channel 13’s “Sunrise.” Poteet is also a actor on broadcast and corporate voice over and on-camera projects. He’s a frequent emcee and volunteers often for Indiana charities. This one man, 24/7 content machine was the first Indianapolis tv personality to plant a flag on the web, starting his own website back in pre-broadband days of 1998. 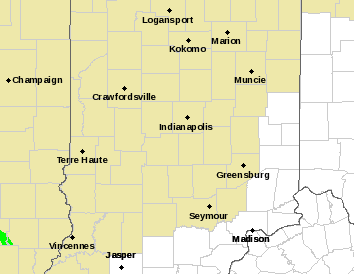 A lifelong interest in weather intersected with a booth announcing gig at WTTV Channel 4 in the 80’s, and put Paul in front of TV weather maps for the first time, sharing studio space with Cowboy Bob and Sammy Terry in the mid to late 80’s. He did weekend weather in Lafayette in the early 90s, and came back to Indianapolis TV as part of a morning show from 1995-2009. Poteet has earned certification as a Meteorologist from Mississippi State University. Paul Poteet has been on the radio for 32 years, getting his start in Huntington, Fort Wayne and Kokomo. He first appeared in Indianapolis as a teen age DJ on WFBQ. He was fired a few months later, and then re-hired a few months after that. And it never stopped. His resume could fill a hard drive, but the highlights include time with WNAP, WNDE, WTPI, and WENS. He spent over 14 years on WRTV’s morning news show. Always an early adapter, he did the first isdn-based daily radio show in the state from his “Studio B” (for bedroom) for a Lafayette radio station in the early 90’s, and has been been featured as a daily personality via voicetracking, isdn, and the plain old telephone in Terre Haute, Muncie, New Castle, and Greensburg Indiana. Before that, he was working the old fashioned satellites when he created, produced and syndicated sports programming that featured IU basketball stars Steve Alford and Ted Kitchel for a statewide network of radio stations in the late 80’s and early 90’s. These days he’s a cast member of the Smiley Morning Show on Z99.5 WZPL in Indianapolis, 98.7 WQME in Anderson, and 106.9 WXXC in Muncie/Marion, NewsTalk 95.3 in South Bend, & 479xx.com in Lafayette. Paul and his writing/performer partner Tom Davis host “The Paul & Tom Show,” an internet radio comedy/talk show that has attracted over 100,000 downloads. Poteet has worked with video producers to create and promote useful, entertaining, and interesting content for businesses and advertisers. 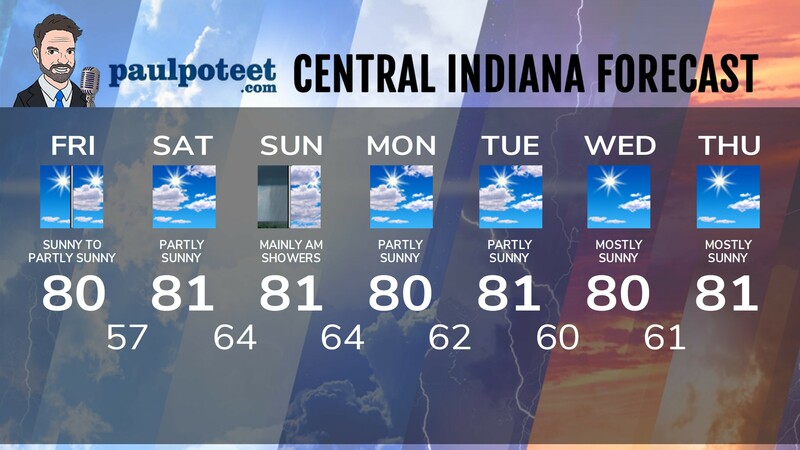 Paul Poteet’s Gotta Eat was produced by Another Cool Design, and Paul Poteet’s Indiana Weekend and Paul Poteet’s Indiana Weather Almanac was produced by Thomas Daniel Media and Twelve Stars Media. He has been named “Best Indianapolis Weatherman” by the readers of NUVO Magazine in 2003, 2005, 2007, and 2009. In 2005 he also came in second for “Sexiest TV Personality.” That was one spicy year. For 2 1/2 years Poteet and fellow television morning personality Tom Davis hosted and produced “Off The Cuff,” an online comedy show that had absolutely nothing to do with either traffic or weather. FAQ: Yes, that was his voice while you were watching the Indianapolis Zoo’s dolphin show. Poteet’s biggest accomplishment ever was finding his wife early in life. They met at WMEE in Fort Wayne. As “Jennifer Carr” she was a radio host including many successful years on WTPI’s evening “Nightbreeze” show. Now, she prefers to let Paul hog the spotlight, and he obliges, even keeping her first name off line. Please, call her “Mrs. Poteet.” They have two cool sons, and a beautiful daughter-in-law. Mr. & Mrs. Poteet love to bike, and travel. Paul runs. He’s completed two marathons, including the New York City Marathon, where he raised over $4,000 for the Pat Tillman Foundation. He has an interest in old time radio and television. Even older than the stuff he’s done. His taste in movies and TV is mostly comedy, and is mostly nonfiction in books and magazines. He strives for nonfiction in his forecasts.